Who are the Cuties? Really?! Led by ukulele enthusiasts Jen Chang and Harvey Soon, we are a bunch of fun-loving people who all share the joy of playing the friendly ukulele (aka uke) in a song circle normally on the second Sunday of every month at the Evergreen Cultural Centre in Coquitlam. Check our 2018 – 2019 event calendar for upcoming activities and date changes. While there is no membership fee, a suggested donation of $3.50 to help defray the venue rental is appreciated. The Cuties bring snacks to share during the 15-minute break. Coffee and tea are provided free-of-charge. What is the Cutie Circle All About? The goal of the Cutie Circle is to bring joy and music to the community through the playing of the ukulele as a group. Though we may encounter the occasional harmonica, kazoo or egg shaker embellishing our tunes, the ukulele is our instrument of choice. If there is any ground rule, it would be that participation in the Circle always involves the live and organic playing of at least one uke and that the enjoyment of the entire group is respected and maximized first and foremost. We welcome ukulele players of all skill levels to sing and strum ukuleles together for two hours on a Sunday afternoon. It is a come-as-you-are and no-strings-attached setting. As we are not an ensemble or a music school, there is no pressure to practise and no homework at the end of the day! Everyone who comes officially becomes a “Cutie”. 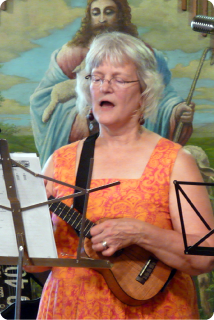 A short performance time provides a forum for eager Cuties who volunteer to share a song on the uke with the group. The Circle is a precious two-hour meeting of enjoying each other’s company and building friendship by singing and strumming our ukes to our hearts’ delight. The beautiful thing about a song circle is that when all the ukes are going, we are free to make mistakes and no one would notice or mind. 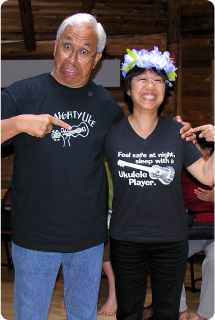 It is a safe, carefree and collaborative environment to have fun, learn and meet your fellow ukulele musicians! Most importantly, it’s all about the laughter we have when we play and the smile we find ourselves wearing on Sunday afternoons. Our Frequently Asked Questions (FAQ) page details how our Circle works. Learning to play the uke has been a life-changing experience. It has enriched our lives with music and brought us closer to others in the community. This is particularly true for those of us who did not receive formal music education as children. The simplicity of the uke (as it has only four strings) makes music learning easier, especially for adults who have busy lives. The funny thing is that no matter how much of a beginner you are, you would quickly find yourself teaching strangers you meet on a walk in the park a few basic chords to get them on their ukulele journey. There were times when we received requests at picnics from bystanders who insisted on putting change in our uke cases for their favourite songs! The last couple of years have been amazing for us who picked up the ukes. As a group, we have crashed pretty much every ukulele circle and attended most workshops in the region. In fact, we very soon discover that even our colleagues know how “gung-ho” we are about the uke when we receive birthday cakes and cards depicting ukuleles! So many kind souls have paved the way for us on our ukulele discovery and for that we are deeply grateful. From the nurturing teachers to music instructors, to the generous neighbour and phone company staff who all chipped in to help with the genesis of our group, it has become apparent that the uke is a uniting force and that it can truly make the world a better place. After all, how often can one say that one got a phone number ending with “UKES” all because of the help from a Nevada call centre operator who just happened to be a Hawaiian from Oahu and also played the uke?! 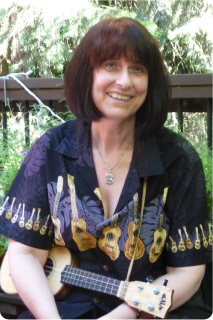 Along the way, the Cuties have found their first sister group, Silver Ukulele Strummers, and it is led by our dear friends, Chris and Val, all the way in Australia. Cuties can feel even more at home when they visit Australia with their ukuleles! We will work on ways to grow this cultural exchange and hope you will share your ideas and thoughts on how to make more ukulele friends! Please be sure to pay our sister group a visit and partake in all the ukulele festivities when you visit Australia. If you are ready to embark on an amazing ukulele journey, visit one of the 25 Fraser Valley Regional Library locations and sign out a ukulele kit through the Uke ‘N Play public lending intiative. It is a collaboration between the Cutie Circle and the FVRL that makes music playing accessible to the community.